Why buy when you can share or rent. That is the essence of The Sharing Economy. Among the best known sharing economy businesses are Uber which allows people to earn income by using their personal vehicle as a taxi and car sharing services such as Car2Go. Lesser known Sharing Economy services include those for sharing parking spaces and storage units. Airbnb, which facilitates sharing of the home, has been singled out as problematic for condo owners. A recent announcement that the Ontario government is partnering with Airbnb in a pilot project may ensure continued growth of short-term condo rentals. The agreement appears intended to make sure Airbnb hosts pay their taxes and comply with regulatory requirements. Toronto Tool Library loans out tools from screwdrivers to power saws to more than 1,200 members. There is access to laser cutting, 3D printing services and a complete woodshop. 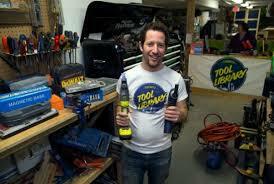 Toronto Tool Library is a non-profit organization where members borrow tools and learn home-repair skills. Members pay $50 to $100 per year for access to more than 13,000 tools from screwdrivers to table saws. Items must be returned in seven days. Stores in Parkdale and East York. The Sharing Depot stocks outdoor supplies that people typically use no more than once a year such as camping and hiking gear, tents, tennis racquets, toys and games. Membership fees range from $25 to $100 per year and can include access to monthly swapping events. Items must be returned in four to seven days. Store on the Danforth. Pret-a-Preter is a clothing library specializing in formal dresses and gowns including high-end designer brands. Membership is free. Rentals start at $25. Store on Bathurst Street at Bloor St. The Kitchen Library offers kitchen appliances for short-term borrowing. Membership is $9 a month. Items must be returned in seven days. Stores on Eglinton Ave. East and in Regent Park. For those with an interest in gardening, Toronto Seed Library is the place to exchange seeds and seedlings for new ones. There are over 20 branches throughout the city where one can borrow or exchange seeds, attend workshops or listen to speakers. No membership is required and most events are free. Donations to a local food charity are encouraged. For those who don’t like to cook but still need to eat, social dining services allow you to book a table in the kitchen of someone you don’t know. You eat a meal prepared by someone else in their home. One local eatery, Chez Lisgar, has a waiting list of over 300. Some guests pay for their meal while others will offer something in trade. For those that don’t want to prepare meals or eat with others, Chowdy and MealSurfers will prepare meals for you that can be picked up or delivered.